What is Virtual Memory? Its Impact on Computer Memory Problems. 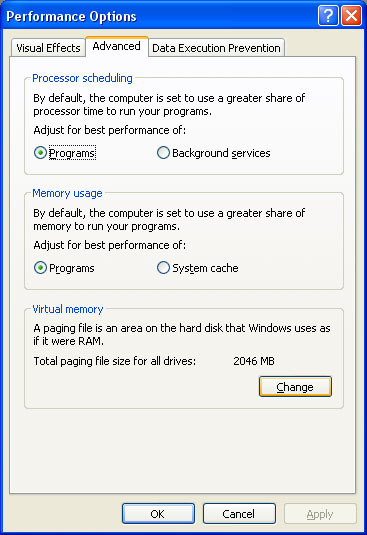 What is virtual memory? Often computer memory problems relate to a lack of space. A definition of RAM: random access memory is when integrated circuits allow stored data to be accessed in any random order. How RAM works is to provide space to read and write data; virtual memory uses areas of RAM not in use. 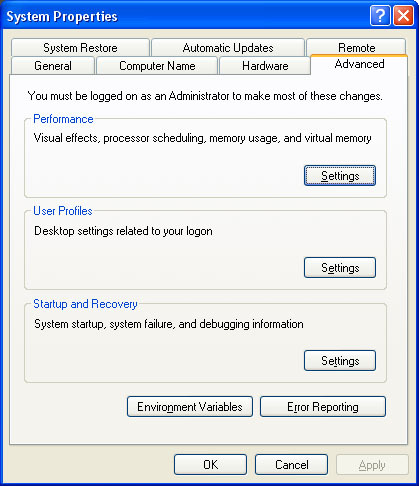 Virtual memory is a common part of all desktop computers. It provides a nice benefit, with a low cost. Most computers today have from 512MB to 2GB of RAM for the computer to use (an understanding of the definition of RAM is useful in understanding 'what is virtual memory'). However, that amount of RAM is not always enough. Internet game playing and computer games can easily use 2 - 4GB of RAM. Software developers will work with multiple applications open and easily eat up 2GB of RAM. If you are into photo or video editing, you have probably used up all of your RAM. On top of all that, computer software applications (like Windows Vista) will easily use 512MB of RAM. This is where virtual memory comes in. This memory prevents your computer from telling you that you need to shut down a program in order to open another. When your RAM gets filled up, your operating system looks the RAM over, finds areas of data that have not been used in awhile, and moves those to the virtual area. This area is on your hard drive and usually takes up around 2-4GB of memory. This all happens behind the scenes, and makes it seem like you never have computer memory problems. The trade-off for this though is that the hard drive is much slower than RAM. Your hard drive area gets split into pages. A page is a contiguous block of memory. The operating system will then move data between the memory pages, and the system RAM. Have you ever seen the message from Windows telling you that you have low virtual memory? This can happen if you don't have enough allocated. When you are low on memory, you will notice your computer slowing way down. There's a quick fix for this that may take care of it, aside from installing more RAM. Below are the steps to increase your memory. 1. Click your Start button, go to your Control Panel, and select System. 2. Click on the Advanced Tab, and click the Settings button. 3. Click on the Advanced Tab. You will see the Virtual Memory section on the bottom of that screen. Normally, you will want to see around 2000MB listed there. If you are getting the message that you have low virtual memory, we’ll increase it here to see if it takes care of that. Click the Change button. 4. If you have multiple drives, you can put memory on any, or all, of them. This is a good practice, to separate your memory out among your different hard drives. 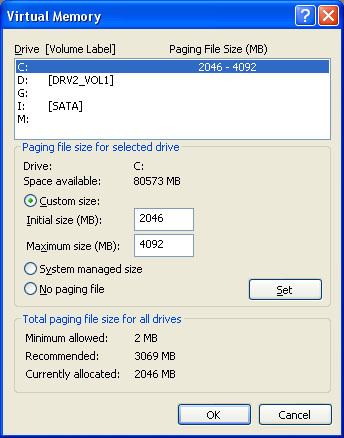 So you could put 2000MB on drive C, and 2000 on drive D. This will help to speed up the access times. 5. As you can see on the screen shot, Custom size is selected, and has set a range of 2048 – 4092. What this will do is allocate 2048MB to be used for memory, and allow the system to increase that amount up to 4092MB. 6. You have a couple options here. You can let your system take care of the memory by selecting System managed size or you can set it to a Custom size. The most common reason people run out of memory is that they run out of hard drive space. In that case, your best option is to either clean out your hard drive or use this window to move your memory to a different drive. 7. Once you have everything set, click the Set button, then click Ok on this window, and the other 2, and Windows will update itself with your new settings, no reboot required. One last note here. You need to understand how RAM works and 'what is virtual memory' to make the above changes. If you need to make those changes and find that your computer is still slowing down, you can set the minimum and maximum values to the same number. This will allocate the entire amount all at once and prevent Windows from having to allocate more every time it needs more. If none of this works, than it is likely that you need to add some more computer RAM. Visit Computer Terminology to learn more about computer definitions and abbreviations.